Part one of a four-part series. Read parts two, three and four. KETURA, Israel -- By night, Israel's Southern Arava Desert, an expanse of rippled sandy terrain, could almost be mistaken for the surface of the moon. By day, it sometimes feels more like the surface of the sun. Here, in the parched region of Eilot, a group of Israeli entrepreneurs and policymakers see a bright future for a burgeoning clean energy sector. This is where they plan to establish for clean energy what California's Silicon Valley is to information technology: what local Israelis are calling "Sun Valley." Israel, a largely arid country with a history of few natural resources, is experiencing a clean technology boom. This series explores how it is becoming a global market leader. Eilot makes up nearly 13 percent of Israel's land mass but is home to fewer than 4,000 people across 15 military installations, 10 kibbutzim and two community settlements. The area has a history of agricultural productivity. But in recent years, leaders in the region have struggled to attract new businesses and young, creative workers. "When we thought about natural resources as something to strengthen us, we thought about the sea, the sun and the open land we have here," said Dorit Banet, co-founder and CEO of the Eilat-Eilot Renewable Energy Initiative, a nonprofit "public-benefit" company. The Eilot region lies just north of the bustling tourist city Eilat, located on the Bay of Aqaba, but is still thought of as the most peripheral region in Israel. "For Israelis, it's considered to be the end of the world," Banet said. Sun Valley could put Eilot on the map and help cement Israel's reputation as an international hub for clean tech development. This month, the Eilat-Eilot initiative, in partnership with the Israeli company Capital Nature, will break ground on a state-of-the-art clean technology incubator. In three years, the $5 million facility will house the offices and labs of up to 25 early-stage companies backed by about $36 million in public-private seed money. Israel has consistently ranked favorably as a place to conduct research and development. The country of 8 million people is said to have more scientists, engineers and startup companies per capita than anywhere else in the world. In the 2009 book "Start-Up Nation," authors Dan Senor and Saul Singer wrote that per-capita venture capital investments in Israel in 2008 were 2.5 times greater than in the U.S., more than 30 times greater than in Europe and 80 times greater than in China. More than two decades ago, the Israeli government established a technological incubator program to transform innovative ideas into viable startup companies. But for years, the incubators focused on biotechnology, medical equipment and software development. Only recently has clean energy become a top government priority. Artist's drawing of a clean technology incubator, a building under construction that will house the offices and labs of up to 25 early-stage companies backed by about $36 million in public-private seed money. 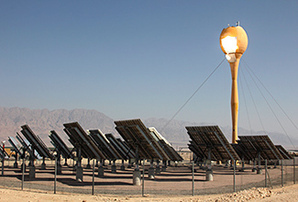 Photo courtesy of Eilat-Eilot Renewable Energy Initiative. Five years ago, the Ministry of Energy and Water Resources launched the Startergy fund, a program aimed at promoting early-stage clean energy startups. Thirty companies have graduated from the development program to date, the vast majority of which secured a second round of financing from strong private investors, such as General Electric. According to Shlomo Wald, chief scientist at the ministry, Israel's clean energy industry is blossoming in a new era. "I think, yes, it may be considered a boom because you can see lots of small but extremely interesting ideas regarding renewable energy that are emerging from Israel," he said in an interview. "And, looking cumulatively ... it is having a real impact on the global market, even if it's not as publicized as ICT [information and communication technology] and medical equipment, which have very strong and good public relations." Renewable energy projects are sometimes harder to justify because they're infrastructure-intensive and generally have to be proved at multiple scales before banks will finance further growth, Banet said. "Part of the big problem in renewable energy compared to the ICT industry is that in ICT you can spend $4 million on two kids sitting in a room operating an app and sell it for $20 million," she said. At the new incubator in Eilot, startups will have access to 50 acres of land where they can build out and test their projects to attract bank investors. "We're gapping the valley of death between innovation and implementation," Banet added. In a 2012 index of global clean tech innovation conducted by the Cleantech Group and World Wildlife Fund, Israel ranked second only to Denmark as the best place to foster clean technology startups. With the combination of government and private venture capital, Israel has recently launched a wide array of low-carbon and energy-efficient technologies, including electric scooters, smart grid technologies, wind turbine composites, robotic solar panel cleaners and flywheel energy storage devices. So, how does a country the size of New Jersey become a clean technology leader? "There's definitely an entrepreneurial spirit in Israel," said Joanna Landau, founder of Kinetis, an organization that promotes Israel's creative efforts. Fifty mirrors reflect the sun's rays up to a tower where Aora Solar's proprietary "Tulip" system converts them into electricity with a jet-engine-sized turbine. Photo by Julia Pyper. Israel is a small market, so business-minded people have always had to think big in order to succeed, she said. There's also a heritage of entrepreneurship. As a country that's just 66 years old, "Israel itself is a startup," Landau said. From the outset, Israeli innovation has stemmed from necessity, she added. As a small country with historically few fossil fuel resources in a politically embattled region, it's had a strong drive to find energy alternatives. In the early 1950s, Harry Zvi Tabor launched Israel into the renewable energy world with the invention of selective coating that dramatically improved the efficiency of solar thermal collectors used to heat water. Today, more than 90 percent of homes in Israel are equipped with solar hot water systems. Israel's roots in solar thermal technology have led it to become an international leader in concentrated solar power (CSP). BrightSource Energy, for instance, an Israeli-founded CSP company now headquartered in Oakland, Calif., is expected to flip on the switch at the $2.2 billion Ivanpah facility in Southern California before the end of the year. The 377-megawatt project will be the largest solar plant of its kind in the world. Another Israeli CSP company, Aora Solar, launched the world's fist hybrid solar thermal power station in 2009 at the region of Samar in the Southern Arava Desert. Last year, Aora built its second solar plant in Almeria, Spain. On a summer's day at Aora's testing facility in Eilot's Sun Valley, the only place to take respite from the heat is in the shadow of a giant mirror. A total of 50 mirrors reflect the sun's rays up to a tower, Aora's proprietary "Tulip" system, where superheated air spins a jet-engine-sized turbine. The Tulip produces 100 kilowatts of electricity and an additional 170 kW of thermal energy that can be used either on the grid or in stand-alone applications. "Instead of farming dates and cows, here we farm the sun," said William Weisinger, Aora Solar's chief technician. The Tulip is designed to operate around the clock. The hybrid system is fired up with diesel, natural gas or biofuel, then runs on 100 percent solar energy through the middle of the day when the sun is at its peak. At night, the fuel takes over again and the turbine operates like a highly efficient generator. Now on the fourth iteration of the Tulip, Aora is looking to go commercial with the launch of a bankable project in either the United States or Europe. Yet another Israeli CSP company, HelioFocus, already has international cooperation agreements signed with companies in the U.S., Canada and China. "Israel is a strange beast because ... we've got a lot of governmental support to incubate. If you can prove you have a good idea, they'll give you startup money," Weisinger said. "Everybody knows this is the startup nation. This is the place you go to do new things."